Another set of documents were also publicized detailing Walmart’s fear of OUR Walmart, a group of Walmart workers who have banded together to fight Walmart’s abusive and exploitative labor practices. The documents involve outright false statements regarding the organization, as well as an obvious statement to convince management and workers that OUR Walmart is not out for their benefit and is out to destroy the company. Indeed, the documents would be hilarious if the issue were not so serious for so many people. Walmart’s warning about OUR Walmart, a short slideshow with incredible amounts of obviously- slanted evidence and out-of-context statements, insinuates that OUR Walmart is a union in disguise and that the organization is only after the employees’ money in the form of membership dues (a hefty $5 per month). While it is granted that the average Walmart employee cannot afford another $5 per month fee, it is also true that $5 per month would pale in comparison to the institutionalized abuse heaped upon the average worker by their corporate employer. Furthermore, OUR Walmart is not a union. It is simply a workers’ rights advocacy organization. OUR Walmart is not currently seeking recognition as a union, although connections between OUR Walmart and the UFCW are clearly very close. 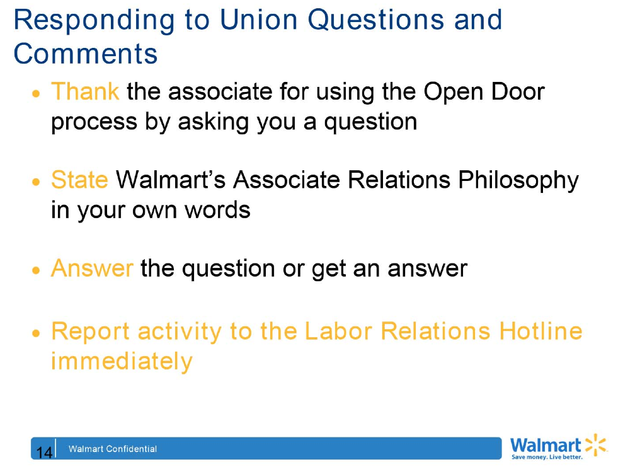 The set of documents which is most interesting is the set labeled “Walmart Labor Relations Training: Salaried Manager Module.” These are the documents in which suggestions are made to managers for the proper ways in which to address employee questions about unions or possible representation. The following graphic is taken from those documents and it illustrates the way a manager is supposed to respond to an employee. Abby Zimet of Common Dreams provides a few samples of what the Walmart training documents have to say about potential conversations between employees and their direct managers. The following dialogue could either be considered terrifying for its use of two-faced Public Relations and heavy-handed company rhetoric or it could be considered laughable due to its own stale and ridiculous nature of discussion. Either way, it is yet another example of the depths to which Wal-Mart will sink simply to avoid paying its workers a living wage. Female Associate: Hey I was talking to one of the guys in my area and they told me that we could get an automatic increase in pay if we got a union in the store. Is that true? Male Associate: Hmm, well that's a good question LaTonya, and thanks for asking, but you know our company doesn't feel that associates should have to spend their hard earned money to have someone represent them and neither do I. But to answer your question, through the collective bargaining process, there's no telling what they will end up with. They can end up with more, the same or even less. First Female Associate: I'm just not really sure about all this union stuff, what would you do Susan? Susan: Well thank you for asking, and you know Walmart doesn't feel like you need a union to speak for you and neither do I. I feel like we work well together and a union would only hinder our ability to communicate with one another. I like the Walmart Open Door Policy where we can communicate openly with our associates, kind of like we are doing right now. First Female Associate: That's true we can, it's kind of nice to be able to do that. In addition, Walmart contains a section that places its fears of unionization right alongside the U.S. Government's alleged fears over terrorism. Akin to an “If you see something, say something,” program, Walmart walks the aspiring manager through steps to recognize the possible existence of union sentiment or union presence in the organization. Aside from asking, “How would Walmart know who is showing up at their employees' homes,” these “warning signs” are obvious enough, particularly when one considers that conditions for dissatisfaction at a workplace like Walmart are present at every turn. One of the designated responses to concerns such as those listed above is to call the Walmart Labor Relations Hotline (1-877-54-LABOR) and inform the proper Walmart authorities. While none of the information contained in this article is shocking, it is nonetheless indicative of the behavior of what has come to be seen as one of the most heartless, greedy, and oppressive corporations across the world. Walmart has taken advantage of political connections within the US government, anti-American trade deals, and a worldwide economic depression to expand its own retail empire and further exploit the average worker, producer, and consumer. It is time the power of Walmart meets the power of the American worker and the American consumer. Below is a list of organizations who are attempting to fight Walmart’s abuses of their workers and their devastation of small towns. Regardless of organization, however, one of the most powerful methods of fighting Walmart is the power of the purse. If you want to help stop the systematic abuses of the Walmart corporation, it is up to you to simply stop shopping there. Walmart cannot survive without our dollars, no matter how poorly they treat their workers or their producers. See more links at hel-mart.com Click here for links. You can also view the documentary Walmart: The High Cost of Low Prices - on YouTube.